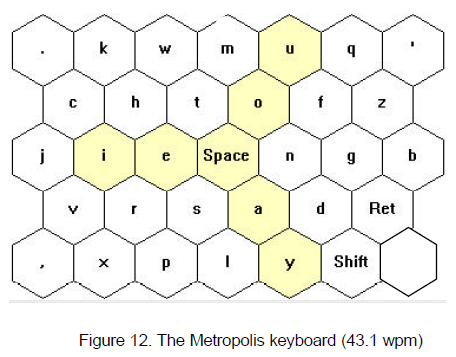 Added four layouts found in The Metropolis Keyboard – An Exploration of Quantitative Techniques for Virtual Keyboard Design, by Shumin Zhai, Michael Hunter and Barton A Smith, which are layouts designed for phones. I think they were designed for one-finger use rather than swiping, but that design philosophy is a lot closer to swiping than conventional 10-finger layouts. As per usual the raw data is in this spreadsheet (ODS format), and here's the executive summary. 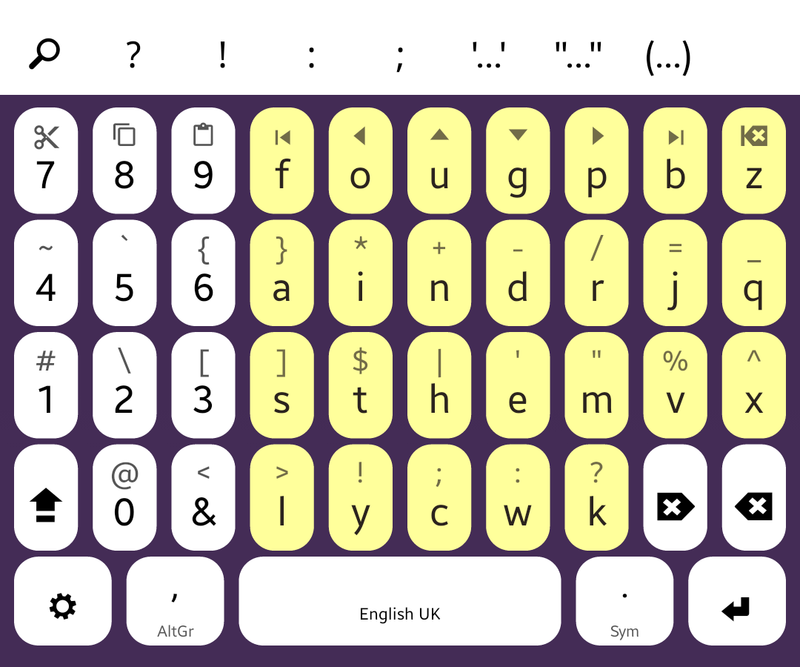 I think Chubron may do better on an ortholinear layout rather than the badly staggered conventional layout. Further refinement. Improved 'have' and 'ould'. The raw data is in this spreadsheet (ODS format), and here's the executive summary. Further refinement. Was trying to improve the for/from strings. 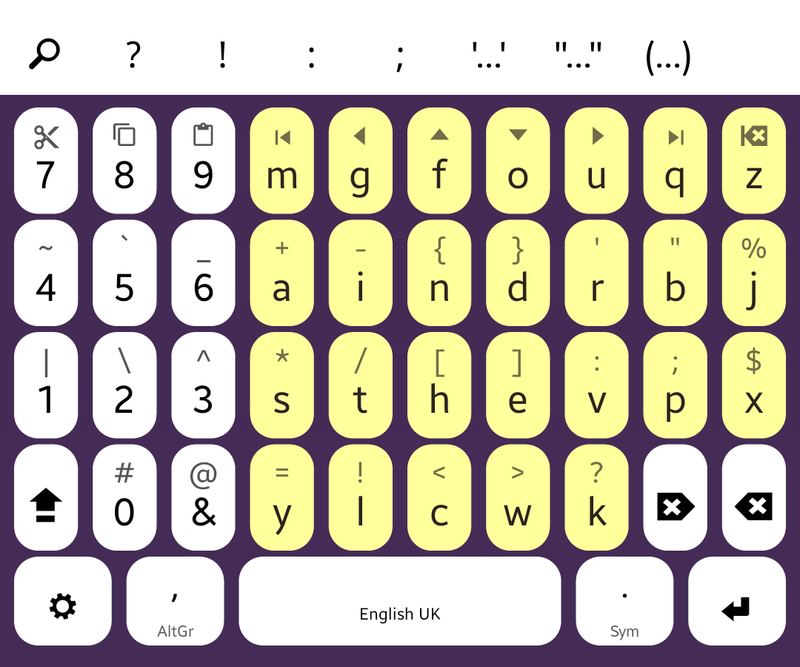 Also redid the punctuation to put the arithmetic symbols next to the numpad. 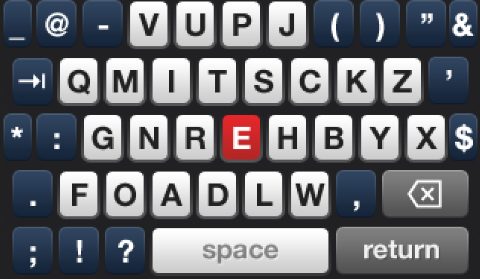 Yes it looks very intimidating, but many common words are very easy to swipe, so I think it will work well. I evolved the above layout from the previously posted Z2 layout, following suggestions from Den. Instead of just randomly looking for common letter combinations, I went back to a proper string analysis (also used in the KLA tests), then counted the number of "steps" to swipe each combination. Then I multiplied it by the count on that linked page, added them all up, and divided by 10000000 to get a number humans can relate to. 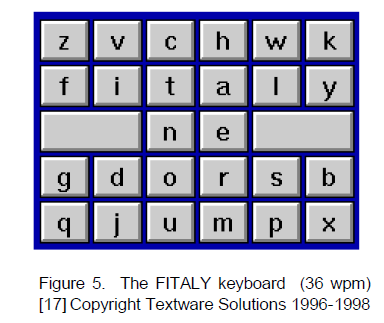 To be fair to QWERTY/Colmak/Dvorak, they are designed for 10 fingers on a fullsize keyboard, not for swiping on a cellphone. 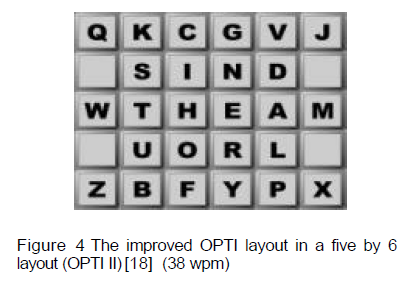 The minor letters (pbzkqvxk) do not feature in the bi/tri/quadgrams so their positioning can possibly be improved.